This challah cover is part of the Ronit Gur designer collection. The challah cover has the Hebrew words “Shabbat Shalom”, “Peaceful Shabbat”, embroidered with gold colored thread on dark blue material. 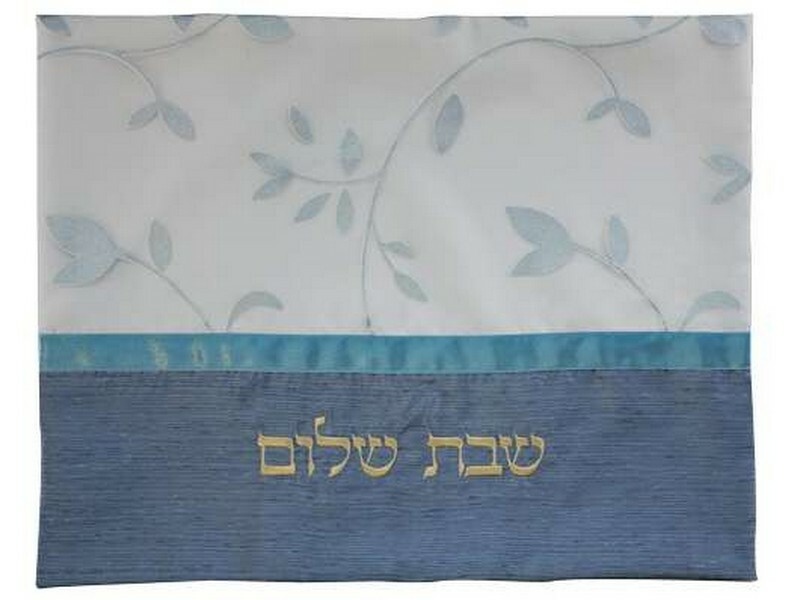 The upper half of the challah cover is embroidered with light blue flowers on a white background. The challah cover is made from polyester material that is constructed to have the same look and feel as that of high quality silk. The Ronit Gur collection is a family owned studio and business located in the city of Ma’a lot, which is in the Western Galilee region of Israel. For close to twenty years, Ronit Gur has produced a fine line of Judaica items crafted with a variety of unique fabrics and materials.